Crush grated coconut and shallots and mix it with the plantains. Heat oil in a pan, add mustard seeds,when they pop upadd chopped green chillies,ginger,turmeric powder,chilly powder ,curry leaves sauté for a minute or two. Uncover , simmer for a couple of minutes and switch off the flame. Let stand covered for 10 minutes before you serve. looks colorful dear...but wondering wats dat tamarind? Looks nice , but the regular tamarind can also be used ? Chitra,...dfntly the regular tamarind and the Kudampuli tastes different.. Very Delicious dear..will definitely try this. looks lovely Sarah and healthy too! Great Click! Wow!! that looks absolutely delicious dear!! !Love ur blog..:)Keep rolling!! I like plantain. Your dish looks so yumm and colorful! Never tried vazhakka thoran with kudampulli.. nifty idea.. Thankyou! Oh, vayil vellam varunnu...! never tried peerapattichathu with vazhakka... simply delicious! vazhakya is also easily available... this was really superb... think why? I read this post and ran out to buy some kudampuli at a neighborhood malayalee store. They had a good laugh at the way I pronounced it. But they finally agreed to sell it to me. Can't wait to make this! 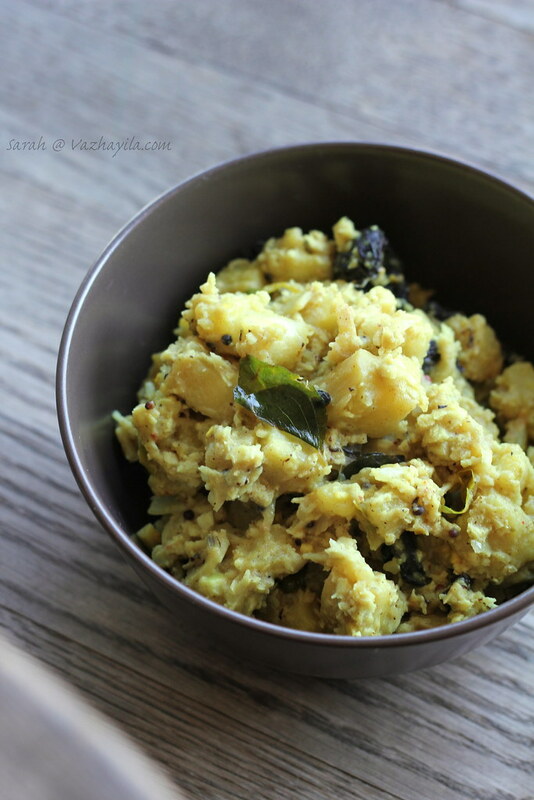 i really love the kerela dishes with plantain ...its this fresh puli available in indian store? I di wish i had all these traditioanl dishes ehre too. YUmmy yumm. Lovely dish. Something different. I will try your recipe surely. Thanks Sarah for dropping by and encouraging words. You yourself have a lovely space. This brings back memory of my chala peera vattichatu. I'm surely going to try this one.